San Diego is known for its great restaurants. Seems like there is a restaurant on every corner, but we're listing what we think are some of the best and most popular in San Diego CA. They include the gamut from the casual and laid-back to the very upscale and romantic. They may even feature spectacular views or outdoor patio dining where smoking is permitted. The restaurants are listed by type of food from Mexican flavors to top-notch steakhouses and every cuisine in between. We only list restaurants with a San Diego address. For restaurants in other San Diego County cities, see their respective city guides listed at the very top of the page. We're bound to miss some tremendous dining experiences. That's because there are so many in San Diego. If you know of a San Diego restaurant that should be included, please let us know. 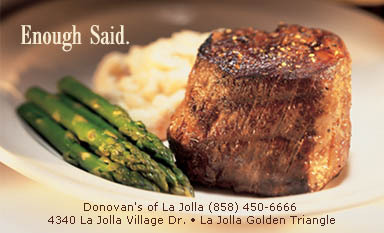 Donovan's Steak & Chop House - La Jolla CALocated in the Golden Triangle area of La Jolla. USDA Prime reigns supreme at Donovan's. The finest steak you'll ever savor. DiRoNA Award and Wine Spectator's Best of Award of Excellence Award. Mouth-watering Prime Rib served every Friday. The Seafood Tower is an award-winner. Enjoy the outside cigar patio lounge. Rei Do Gado - Brailian BBQ in The Galslamp QuarterThe Gauchos, Brazilian cowboys, usually cook the meats with skewers slowly roasting in the heat. All the meats were marinated with simple seasoning and served with salads, Brazilian rice and beans. Bandar Restaurant - Fine Persion CuisineIn the Gaslamp Quarter, Bandar prepares the finest Persian food in the city (36 dishes). Bold flavors such as garlic, onion, dill, and mint predominate, adding up to impressions of complexity and intrique rather than spicy heat. Dussini Mediterranean Bistro - Gaslamp QuarterAfter months of planning, the vision emerged for Dussini with a warm and friendly atmosphere, highly-trained staff and an inviting range of exciting Mediterranean dishes from an olive tapenade appetizer to monkfish a la Nicoise, osso buco alla Milanese and paella. Greek Islands CafeJerry G. & Liz Bishop invite you to experience the waters-edge wonders of Americas most charming, authentic Greek Cafe, just steps from San Diego's landmark Convention Center. Harbor House - Seaport VillageThe Harbor House opened in 1980, and serves fresh fish, shellfish, premium steaks and local draft beers. La Fiesta Mexican Restaurant - Gaslamp QuarterWithin walking distance of the nearby Convention Center La Fiesta offers festive food, atmosphere and entertainment that would be more typically enjoyed in cities along the Mexican Riviera such as Mazatlán, Puerto Vallarta and Acapulco. Trattoria La Strada - Gaslamp QuarterOffering one of the most extensive wine list and the finest Italian food, Trattroia La Strada has been attracting for years the finest local clientele as well as hosting some of the most prestigious corporate parties in San Diego. Monsoon Fine Cuisine of India - Gaslamp QuarterMonsoon Fine Cuisine of India features outstanding, authentic North Indian cuisine served in an elegant surrounding. Osetra the Fishhouse - Gaslamp DowntownOsetra the Fishhouse offers gourmet seafood, prime-aged meat and one of the city's most extensive collections of premium wine. Rainwater's on Kettner - Downtown San DiegoRainwater's on Kettner sets the standard for upscale fine dining in San Diego, offering: world-class steaks, superb fresh fish and assorted seafood dishes, and the finest winelist on the west coast. Sushi Bar Nippon - Horton PlazaA traditional Japanese Sushi-ONLY menu enables us to provide our valued patrons with the finest quality sushi there is. We will cater to your personal preferences. Allow us to surprise and delight you! The Prado Restaurant at Balboa ParkLocated at the historic House of Hospitality in the center of Balboa Park. Specializes in Latin and Italian cuisine. George's at the Cove - La Jolla VillageSpectacular ocean views accentuate three distinctive dining experiences at George's at the Cove, in the heart of La Jolla Village. The elegant fine dining room features fresh seafood, steak and creative regional cuisine prepared by Executive Chef/Proprietor Trey Foshee. Pacifica Del Mar - Del Mar CAExperience award-winning cuisine and cutting edge design in one of San Diego's most popular ocean view restaurants! Casually sophisticated, Pacifica Del Mar's striking setting is a sensual canvas for Chef Chris Idso's highly acclaimed Creative Coastal Cuisine, served daily for lunch and dinner. Jack's La Jolla Jack's La Jolla is three distinctive restaurants ranging from casual to fine dining and four unique bars. Trattoria Acqua - La Jolla CAAuthentic home style Italian food in a Mediterranean setting. Enjoy our good taste while overlooking beautiful La Jolla Cove! Szechuan Mandarin Restaurant - Mission ValleyA Chinese wonderment creating a culinary fusion of tradition & fresh ingredients. Complete with culinary experience out on the Cigar Terrace while enjoying a fine cigar. Seau's The Restaurant - San DiegoOwned by All-Pro Linebacker Junior Seau, the restaurant serves a contemporary American grill cuisine with an all-star lineup that includes salads, sandwiches, burgers, pizza, pastas, grilled fresh fish, and desserts. Baleen Restaurant - Paradise Point Mission BayWhat's the point in enjoying fine food if you can't have a little fun while you're at it? Our signature restaurant, Baleen, invites both your palate and your sense of adventure to a waterfront dining experience like no other. Croce's Restaurant & Jazz Bar - Gaslamp QuarterOur award-winning American Regional Restaurants featuring fresh fish, prime meats, pasta, salads and house-made desserts are open for breakfast, lunch, dinner and late-night dining daily. Ki's Restaurant - Cardiff By the SeaAfter fifteen years of continual growth, Ki and family moved their restaurant to the beach in Cardiff where it resides today offering an array of food and drinks made from high-quality organic (when possible ) fruits, vegetables, grains, eggs, dairy, fresh fish, poultry products and beef. Cavaillon Restaurant - San DiegoChef Philippe Verpiand has over 20 years of experience delivering the highest quality, gourmet cuisine throughout France and the United States. Philippe's talents were refined through working with world-renowned chefs in Provence, Biarritz and the French Riviera. Dussini Mediterranean Bistro - Gaslamp QuarterDussini Mediterranean Bistro, an upscale and intimate restaurant with a distinctive menu, has opened in high style on the site of The Old Spaghetti Factory in San Diego's Gaslamp Quarter. Scalini Restaurant - Del MarScalini presents exceptional Italian/Mediterranean cuisine that is both contemporary and exciting. Cuisine that is prepared by a chef with a passion for perfection and served in a setting of truly old world charm and warmth. Star of India Restaurant - Downtown, Carmel Valley & Paciic BeachWith such a wide range of offerings in San Diego, finding an Indian restaurant that has just the right mix of atmosphere and hospitality, along with authentic taste and quality spices and ingredients, is not as easy as one might expect. We hope that once you arrive at the Star of India restaurant, you will feel it was well worth the journey. La Vache - A French Bistro - Hillcrest in San DiegoThe combination of rich wood wine racks, velvet window coverings, mirrored walls and romantic candelabras on the tables at dinner, makes for a delightful ambiance. But it's the food that is the crowning glory. dazzling the palate with French and Mediterranean flair. China Max - A Seafood Restaurant in San DiegoThe real excitement of China Max lies in the dishes you would never expect to find in a Chinese restaurant - masterful twists on traditional Cantonese fare and creative blends of Western flavors and Asian finesse." Bombay Exotic Cuisine of India - DowntownBombay Exotic Cuisine of India produces sophisticated and elegant food. Bombay's cuisine could grace any major city in this country. Every item was fresh, interesting, and healthful, and the dinner offered spicy, sweet, and cool dishes. Lamont Street Grill - Pacific Beach AreaPB's most romantic restaurant serves California comfort food, punctuated by bold and sometimes strange Mexi/Asian/Cajun flavors, in a rambling converted residence with several rooms and levels. Adams Avenue Grill - University HeightsAdams Avenue Grill is really two eateries in one: a sunny, informal lunch spot by day and a gently sophisticated dinner destination by night. Del Mar Rendezvous - Del MarA Modern Chinese and Asian Fusion Restaurant in Del Mar. Del Mar Rendezvous serves contemporary fare, featuring dishes from many regions of China and select Asian countries. Firenze Trattoria - EncinitasFirenze provides fine Italian dining in San Diego. Come on by and discover a great variety of fresh, handmade Italian dishes cooked to order by our Italian chef and take a look at our exclusive wine list, At Firenze you'll only taste the finest Italian Cuisine in San Diego.